Last Update Apr 2019 – If you are hearing the word “duck press” for the first time, it surely would have aroused your inquisitiveness, and put your grey cells to work. One thing is certain, your deductive powers would have given you hundreds of answers, but the last thing that you would think of as a duck press is a kitchen implement. Yes, a French duck press is a kitchen implement, which has a very special use. For anyone, who is privy to the food culture of France, would need no introduction to this fairly simple device. While many of you would like to believe that a duck press is used to press the fat out from the duck, but you still are nowhere close to the real answer. Let us put all your anticipations and enquiries to rest. 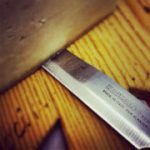 In layman terms, a duck press is a kitchen tool used to press the duck carcass in a manner that it squishes out even the last drop of blood, and the last morsel of bone marrow from the carcass.The blood and finely shredded soft bone pieces are then used to prepare a sauce. Many people call the process macabre, but French cuisine lovers call it their way to sheer gastronomic delight. 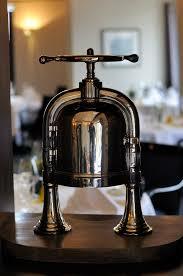 The duck press is no modern, hi tech gizmo that is used to churn out duck delicacies. It was invented way back in 1800s in France. 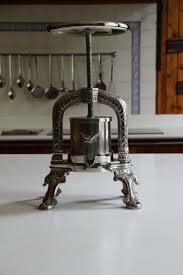 The antique duck press was first used by a French chef known by the name of Mechenet. He used it to make one of the biggest French gourmet classics of all time known as Duck in blood sauce or Caneton de Rouen à la Presse. The critics or animal lovers may call it gruesome, but those who love French food can die for this dish (not quite literally!). This dish touched new heights of popularity when Chef Frèdèric of the famous French restaurant La Tour d’Argent patronised this dish, and made it their signature dish. He also started a tradition of preparing the dish, right on the table, in front of the guests. The popularity of Caneton de Rouen à la Presse can be judged from the fact that La Tour d’Argenthas has sold over a million of them till date. Later, came the Edwardian era in Britain, and the duck in blood sauce saw itself touching the peak of popularity, when London’s elite wanted to indulge in everything that was classy, extravagant, and sophisticated. Thankfully, this dish qualified all these criteria and was embraced by the upper class. Want To Know Exactly How The Press Looks And Works? Warning: The details might be a little a ghastly for the vegetarians and animals lovers (it’s not like the duck is stilla alive! ), but the French food lovers would have their mouths salivating as we go into the finer details of a classic dish. Jokes apart, making Caneton de Rouen à la Presse is a work of art. The duck press is commonly made up of a heavy metal like brass. The brass duck press 1995 comes with a disc that is attached to a metal rod in a way that it can be lowered and adjusted to press the carcass. It stands on a four legged pedestal, and there is a spout at the bottom from where the blood and fluids are collected. The preparation starts with marinating and roasting the whole duck after removing the innards. The heart and liver are kept aside. The duck along with the duck press are taken to the guest’s table, and then the fun part begins. The legs are removed; the breast pieces are shredded, and kept in the serving dish. Then the carcass is placed in the duck press, and the wheel is screwed down, and it’s pressed hard until the time the carcass becomes absolutely flat to the point that even the soft bones get shredded into pieces. The fluids collected are then cooked with some wine, or cognac, and used as a sauce over the breast meat. Irrespective of how the details may sound, the end result is a smooth and extremely delicious entrée that can impress even the most demanding of food connoisseurs. No, you don’t have to be a lover of Caneton de Rouen à la Presse to own this amazing piece of kitchen equipment, your love for anything that is antique and collectible should be enough. Unfortunately, these days, duck presses are rare and expensive. So, where would you find one? Going to France to fetch one might not be a very viable proposition – but being 20 inches (50cm) tall and weighing in at 30lbs (13kg) you would want to get it delivered. 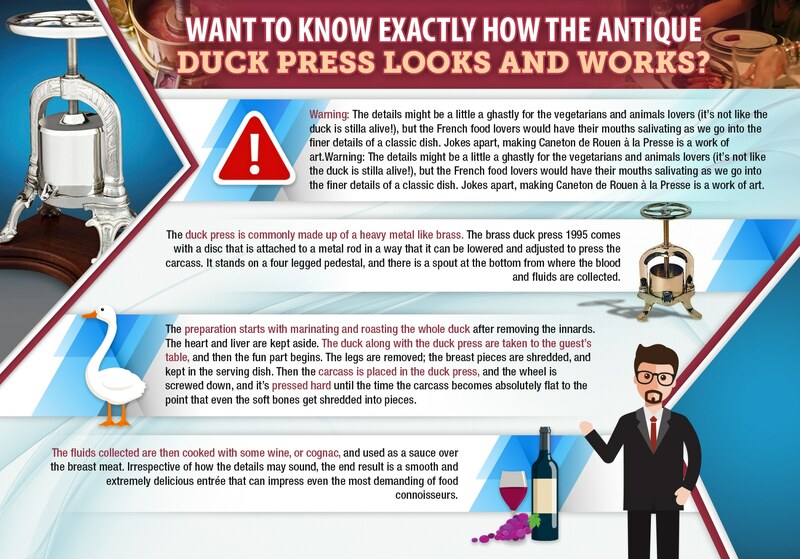 We did some research on Google and searched for everything from “duck press shopping” to “brass duck press 1 995”, and we found out that the duck press was available on Amazon. In fact, we found 2 of these on Amazon, with some difference in features and price. But be warned – they don’t go cheap ! However, the great thing about Amazon is that they have great price on these items – but if you are keen to get your hands on one move fast as they tend to be rare and sell out quite quickly! This brings back memories – years ago, dinner at La Tour d’Argent on the banks of the Seine in Paris. Famous for their Duck Press and the fabulous dish with blood gravy from the press! Every time the dish is served, it is numbered and entered into the records! Sounds absolutely amazing Annie .. what a fantastic experience .. do you often travel to Paris? 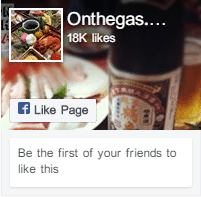 Favourite restaurant ? Thanks for the info. I’m researching the history of duck presses because we have 3 antique duck presses in our gallery, here in New Orleans ( http://www.rauantiques.com). I love the way they look…..I’d like to see one in use!